Despite the well-recognized role played by clouds and precipitation in affecting our climate, gaps in the remote sensing capabilities of their vertically resolved microphysics significantly hamper progress in understanding the physical processes within them, whose parameterizations underpin numerical weather and climate models. A previous CEOI-funded seedcorn study (HIDRA4PPM) has established the potential of G-band Doppler radars (i.e. frequency between 110 and 300 GHz), in combination with Ka and W-band millimetre wave radars, to improve current profiling capabilities in precipitating snow (see Figure 1). This is achieved by partially overcoming the snow microphysical deadlock, i.e. the dependence of the snow rate on the snow microphysical characteristics: particle habit, fall velocity and size distribution. The present work aims at further developing a mission concept based on a dual frequency, 35 and 240 GHz, Doppler radar with radiometric mode for the detection and quantification of mid and high latitude precipitation. STFC-RAL will focus at developing a prototype of 240 GHz frequency multiplier with the challenging high output power level required to drive the radar transmitter’s output stage. The University of Leicester will analyse the potential of the system to improve further the retrievals of microphysical properties in precipitating snow and also in stratocumulus, cirrus and mid-level ice clouds. 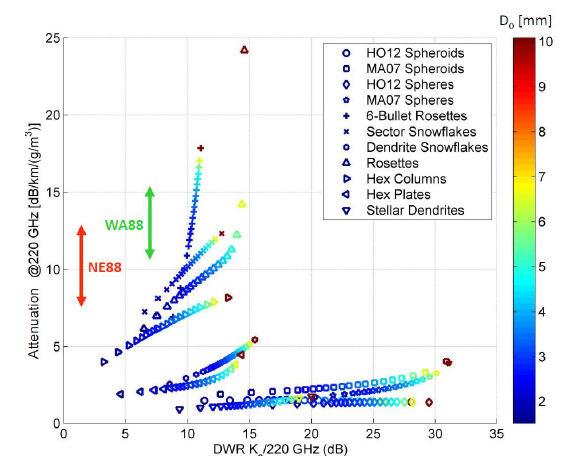 Figure 1: Snow attenuation per unit mass at 220 GHz for different snow particle habits and particle size distribution (the colour indicates the mean volume diameter of the particle size distribution), plotted against Ka–220 GHz dual wavelength ratio (DWR). A 35-220 GHz radar measurement has great potential for identifying the dominant particle habit and the mean particle size. See Battaglia et al., 2014 for details. Our study indicates that because of the introduction of distinct extinction properties, the 220-260 GHz band has great potential in distinguishing different snow habits. Moreover the same frequency band is also very sensitive to the presence of liquid water in clouds. This can shed light onto riming processes which are essential in affecting the snow particle density. In synergy with a lidar system, which is capable of detecting the cloud top, the 240 GHz channel strongly improves the profiling capability for supercooled liquid droplets, with clear extra potential in constraining the mass-dimensional relation and in quantifying snowfall rates remotely. For these reasons radars in the 220-260 GHz band are highly recommended for future space-borne missions targeting snow precipitation. The parallel technical development work at RAL has lead to the design and fabrication of a high power 240 GHz tripler. This single chip device is able to handle 300 mW of input power. The tripler has a measured efficiency slightly lower than the prediction, around 5.5 % instead of the expected 8 %, but it covers a wider than expected frequency band. A revised narrower band design with improved efficiency would fully meet the needs of driving the EIK tube amplifier. A bespoke multiple anode GaAs Schottky diode structure been created and fabricated. Four blocks have been assembled and tested successfully, with demonstrated high input power handling, up to 325 mW. Maximum power conversion efficiency is nearly 6%, and maximum output power is 15 mW. An optimal-estimation-based retrieval technique for profiling snow clouds has been developed. Quantify multiple scattering effects for the G-band radar in presence of thick ice clouds. Study about the dual wavelength reflectivity ratio behaviour in presence of multiple scattering. The multiplier performance deviates slightly from predictions: efficiency is lower than expected, and the optimal output frequency is shifted to a value about 15 % higher that the design value, 250 GHz. The main reason is attributed to a lower than expected diode breakdown voltages: 5.5 V as opposed to the anticipated 8 to 9 V. Cleanroom process improvements are underway to address this problem. Our roadmap towards an ESA TRL of 4 for is based upon the conclusions above report and current MMT work in producing space qualified devices Schottky for MetOp SG. This work encompasses the design, test and qualification of frequency multiplier and mixers using passivated Schottky diodes. The main obstacle in achieving a useful tripler component with a TRL of 4 is providing diodes with the anticipated reverse breakdown voltage than can handle the relatively high powers. The state of multiplier development is such that we cannot yet determine the maximum realisable efficiency, and therefore if power combining will eventually be required. However, the current design performs over a wider bandwidth than is required, and a redesign should concentrate on narrowing the region of best performance and ensuring that this coincides with the desired operating frequency. A revised tripler design is required with performance optimised in a narrow band around 240 GHz, with little sensitivity to changes in temperature of a few tens of degrees. This would need the highest efficiency and lowest drive powers: both will enhance the device lifetime and place least demands on the driving amplifiers. This will also facilitate increasing the output power if/when the E1K tube gain decreases during its lifetime.